There is still a demand for the skillful use of grinding wheel dressers, despite the fact that a great deal of precision surface grinding has been replaced by Wire EDM. No matter how much can be done in the CNC milling and WEDM department, you still have to use a manual surface grinder. 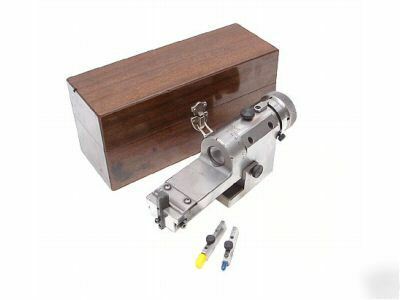 This is one of those toolmaking skills that requires considerable time and patience to master. Hopefully shops are training young people to take the place of the old-timers who are ready to retire. Most injection mold making shops need a grinding wheel dresser that is accurate, fast, and low maintenance. If the dresser is so complicated to use that only a few individuals are capable, it is not practical. Also, because precision surface grinding is by nature a slow, tedious process, the need for speed is important as well. There are basically two types of grinding wheel dressers: under the wheel dressers and on the side dressers. Preferences vary with users, but you see many more under the wheel dressers in use. In the past, most dressers were on the side, but with the introduction of a highly precise under the wheel dresser that is very easy to use, most shops abandoned the older style. Personally I hated using the old style dressers that placed the diamond on the side of the wheel. 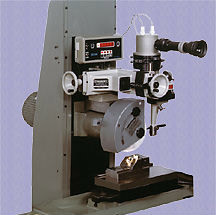 There are also wheel dressers available that use optics and magnification to project the wheel form on a screen. These attachments are in use in many shops today and are highly accurate, though rather expensive. The results were nearly identical, except for two things: speed and cost. The under the wheel dresser was quicker to use and cost a lot less. Of all the radius/angle dressers that are commonly available, the simple to use under-the-wheel dresser is the most accurate and easy to use. A small magnifying glass is incorporated to aid in picking up the edge of the grinding wheel, which saves a lot of headaches. The engraved graduations on the fixture are also highly accurate and, for most applications, are satisfactory. In the event that you need exact angles, it is simple to set and check on a magnetic sine plate by indicating with a dial indicator. Another very useful item for radius and angle dressing on a precision surface grinder is the boron carbide dressing stick. Norton’s name for this is Norbide, though there must be other brands as well. Very often it is necessary to redress the corner of a grinding wheel to maintain a sharp, 90 degree corner. Instead of disrupting the grinding operation and mounting a wheel dresser, it is possible to simply use the boron carbide stick manually. With some practice this becomes routine and is a real time-saver. Overall, nearly any radius or angle can be dressed on a typical grinding wheel with a minimum of quality tooling. The basic requirements would be an under-the-wheel radius dresser, precision angle plate, set of diamond nibs, gage blocks, boron carbide stick, granite surface plate, surface gage and dial indicator. All of these industrial supplies are essential and only the highest quality will consistently produce the highest quality results.